Another shot in the “pictureadaychallenge”. I took this picture in the frontyard of one of my clients today. 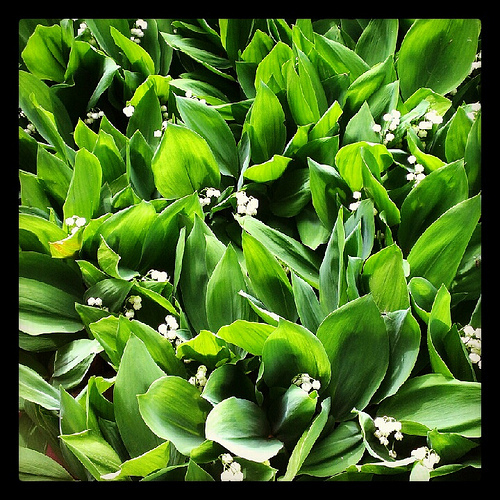 She grows a wonderful little garden and the fresh green color dominated above all, made it look kind if juicy. I’m not entirely sure what exactly I see here, but I think it’s Lily of the Valleys. Where did you stand today? 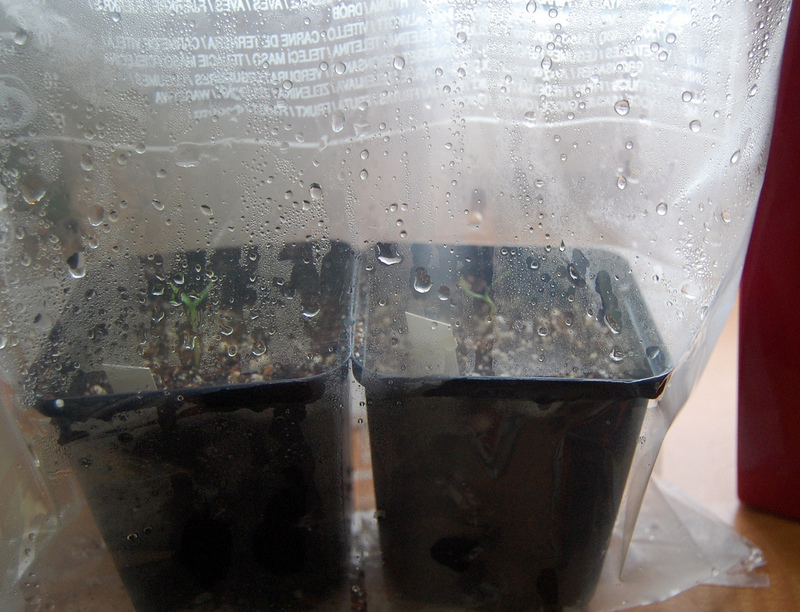 Coming home I saw that my chili peppers started to see day light, while the limes are still hiding in the soil. 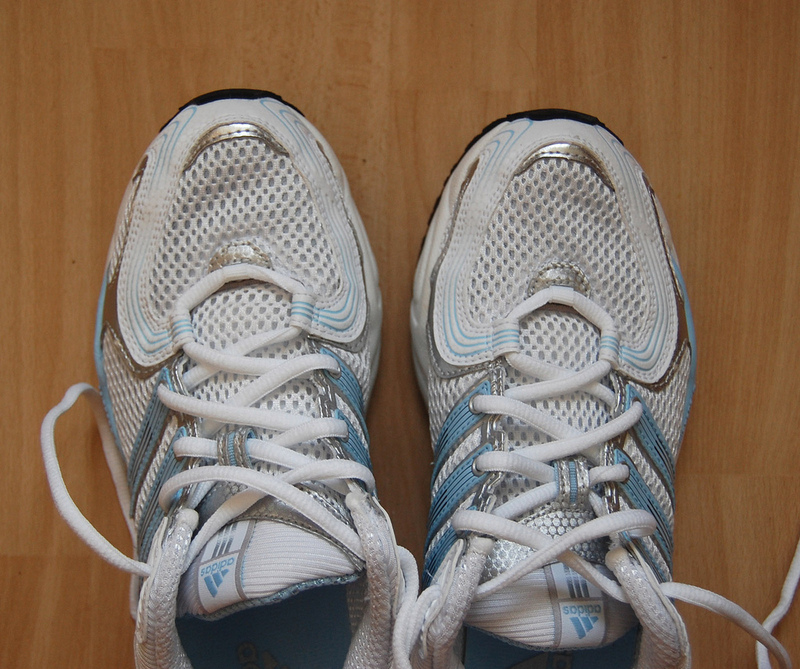 Yesterday I got myself new sneakers – no more “I can’t do sports now, I don’t have shoes”, probably this lack of excuses will make me do more sports. So be aware when you feel a sudden wind, it might be me, hehehe! and even thouh I’m not really in the mood for crafts I still made something. I crocheted a viking horn. You might find the color irritating, but the pink was at hand when I started and I find the idea of a helmet with pink horns amusing. I made this horn as a test for a friend earlier this week and now wonder what else this shape might be useful for. Alien feet, birds beak, tails? Anyway I start to get over it and slowly but surely feel better and I wanted to show you what happens around here when I’m not at home. First: yarn arrives at the neighbours and now made itself comfortable in my room. This is Bouquet from SunnysideEllen, from etsy. She has awesome colorways and I fell in love with the green/pink one the minute I saw it. I want to make knee highs and after realizing I would need two skeins I started realizing that this might be the most expansive socks I will ever wear. But I needed it, I adore it and green and pink goes fantastic with my other wardrobe so I bought it. Now it’s mine. I’m not sure yet which pattern to choose. I think the yarn is selfstriping and I want to show off both, the yarn and the knitting I put into these so I want a nice stitch pattern, also I think plain stockinette for a whole knee high sock might be a bit boring to make. Next to my yarn there arrived seeds from all over the world, even malaysia, I didn’t expected these to really make to my home since I know that it actually isn’t really all that legal to import non-native plants, but they arrived so I don’t feel guilty. I already started to put them into their new beds. Below you can see my mini-“greenhouses” for one key lime, one rangpur lime, one cherry sized chilie pepper and one normal sized which should be black, I’m curious about this one. Also I wonder how sweet the cherry sized one will be, it says sweet but what is sweet when compared to chili peppers? 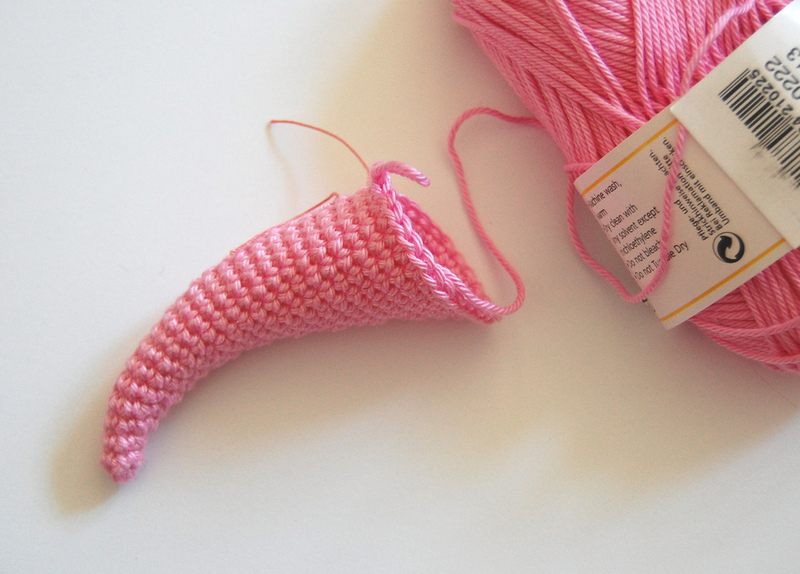 And in case my crocheting friends started to wonder if I still crochet, yes I do!, I started thinking about a cute way to make an elefant. It’s trunk gives me some head scratchers. EDIT: oh I almost forgot, the icarus socks are growing. I printed the rounds of the first sock and knitted on the train on the second sock, so they are both about the same size now and almost finished. I really like how they turn out. What I really love is how they look when not worn, how the lace pattern ‘contracts’ the front and how the wing design looks so organic, lovely! I received mails if I might put out a pattern and though why not, although I need to warn you that this will not be a “real pattern”, but more a good guide to create yous own, I have no idea how to write a complete sock pattern and don’t want to mess around with sizing and gauges and how to make toes or heels, but I will include everything you will need to know about the shaping of the calf and what happens throughout the pattern that gives certain effects. But please bear with me, it will take a bit of time until I can put a pdf out. I have been pretty busy lately, life interferes whenever it gets a chance to. it’s actually pretty simple if you have enough time. 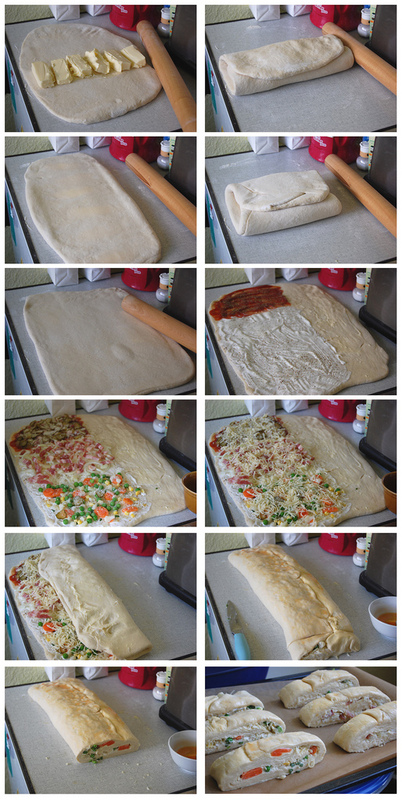 you make a normal pizza dough / bread dough as you like and treat it like puff pastry, meaning to put butter on top and fold the dough so the butter is covered completely, then roll the dough again and fold once more. Now roll and fold again. Roll to the size you want and start to add the topping. I made three versions. One pizza-style, one like onion-tarte (I have no idea how to better call this in english, I’m sure there is a proper name for this, it’s basically onion rings and bacon on some sour cream) and the third version is with frozen veggies on top of sour cream. Now cover everything with cheese and wrap it up. First top down and then bottom up. 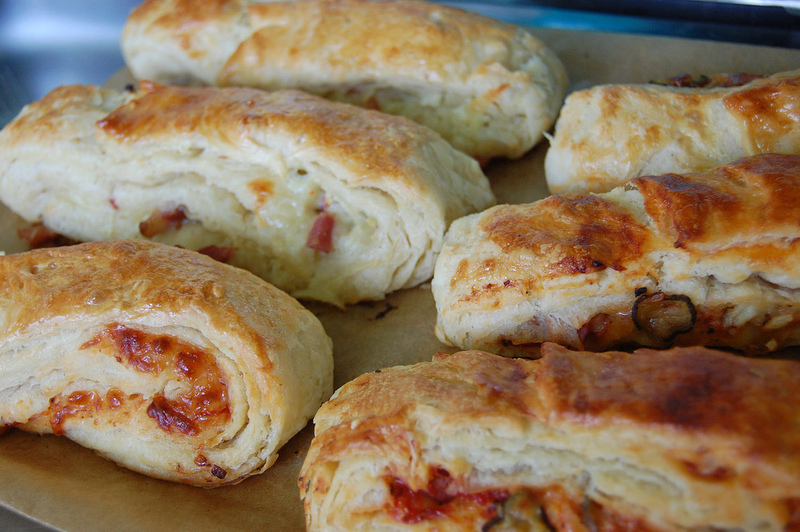 spreaded with egg yolk and cut into pieces and bake for about 20 minutes at 170°C or until golden. We liked the version with the vegies and the onions the most. I haven’t had tomatoes on the pizza version which I find where missing, but since I didn’t knew how wet the dough might get I didn’t want to make experiments. I also knitted. 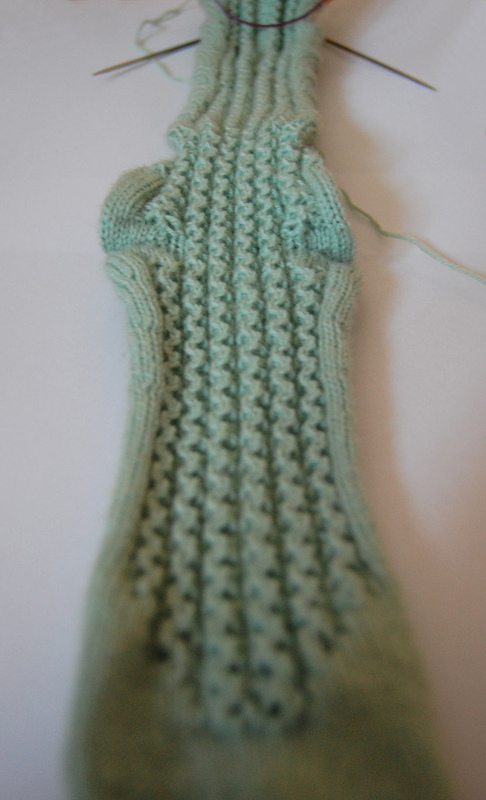 I turned this swatch into a new stocking, or into the beginning of a new stocking. I started with two at a time (I fear I’m a candidate for second sock syndrom if I wouldn’t do both at once) but since I frogged some times I decided to continue with only one and write down every single thing I do. I needed to re-knit the heel because on the first try it turned out too small and also a bit too tight. So I increased a few stitches which I decreased again after the heel and started with the wings very soon. I like the look of it and I also enjoy the yarn more than the brown one, it’s alot smoother although it often feels quite dry. And I think the mint color would be better with a more “floral” pattern but I still like it with my design. I frogged a big part of the leg again later because the insert that I made created some strange “bending” in the rest of the lace sections of the front. 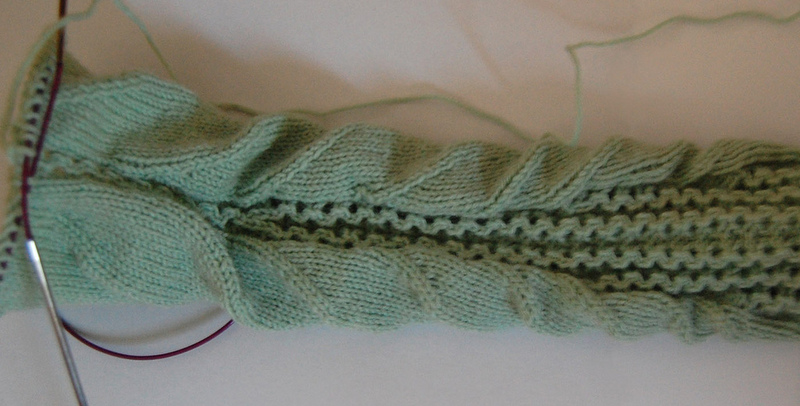 Now I only increase purl stitches between the single lace parts and it looks alot better. Not so funny, I’m single again. Nine days ago I got the final call. It’s not like I didn’t saw it coming, we had a long distance relationship, which is hard and now that he suffers from burn out syndrome he can’t stand the “situation” any longer. I always tried to be understanding and calm and “be there for him” (as far as one can be if you’re not living together) but it seems that it’s finally over now. Resulting current distraction: my green thumb. I read alot lately about my plants and fertilizers and waterings and stuff and I learned why my lemon tree always signals me he wants to die in winter time. And to top it all I ordered all sorts of new seeds, alot of chili peppers and tomatoes but also a red kiwi, didn’t know there was such a thing. 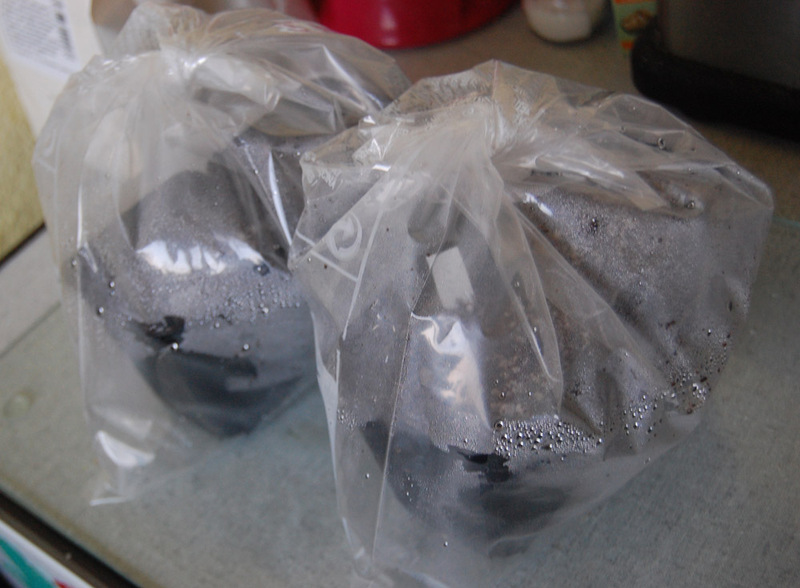 I will try to grow them this season even though I know it might be too late already to have fruits this year.